It’s common for businesses to make thank-you gifts to customers, clients, employees and other business entities and associates. Unfortunately, the tax rules limit the deduction for business gifts to $25 per person per year, a limitation that has remained the same since it was added into law back in 1962. Fifty-five years later, the $25 limit is unrealistically small in many business gift-giving situations. Fortunately, there are a few exceptions. Gifts to a married couple - If you have a business connection with both spouses and the gift is for both of them, the $25 limit doubles to $50. Incidental costs of making a gift - Such costs aren’t subject to the limit. For example, the costs of custom engraving on jewelry or of packing, insuring and mailing a gift are deductible over and above the $25 limit for the gift itself. 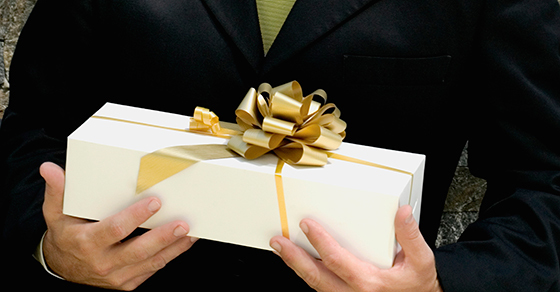 Gifts to employees - Although employee gifts have their own limitations and may be treated as taxable compensation, an employer is generally allowed to deduct the full cost of gifts made to employees. Gifts vs. entertainment expenses - In some situations related to gifts of tickets to sporting or other events, a taxpayer may choose whether to claim the deduction as a gift or as entertainment. Under current law, entertainment expenses are normally 50% deductible, so the gift deduction is a better deal for lower-priced tickets. But once the combined price of the gifted tickets exceeds $50, claiming them as an entertainment expense is more beneficial. Be aware, however, that the elimination of the entertainment expense deduction has been included in proposed tax reform legislation. If legislation with such a provision is signed into law, it likely won’t go into effect until 2018. To the extent your business qualifies for any of these exceptions, be sure to track the qualifying expenses separately (typically by charging them to a separate account in your accounting records) so that a full deduction can be claimed. In addition, you must retain documentation of the following: A description of the gift, the gift’s cost, the date the gift was made, the business purpose of the gift, and the business relationship to the taxpayer of the person receiving the gift.